This is such a sad story but it is so good. I might never have discovered Willy Vlautin but his latest novel was the February selection of The Nervous Breakdown Book Club, to which I have a subscription. Don't Skip Out On Me came in the mail. Then Brad Listi had Willy on his Other People podcast and I got a crush on the guy just listening to him talk. He is a down-to-earth blue collar family man who writes novels, writes songs, and plays in a band. Horace Hopper is a half-blood Paiute Native American. His mother dropped him off at his racist, Paiute-hating grandmother's when he was just a little kid and never came back for him. As a teen, he became a ranch hand for an old Nevada sheep raising couple, who made sure he finished high school and treated him like a son. Enough damage had been done though so Horace never felt he was good enough to deserve the love and care he got from Mr and Mrs Reese. He thought he needed to be somebody first. At 21 he takes off to become a boxer. Hating the Paiute part of himself he endeavors to pass as Mexican. Once Horace goes out on his own the story gets more sad than ever. He knows how to work hard and he gets a job and a trainer. His worst trouble is loneliness but he also gets taken advantage of by his trainer. He is good at taking abuse but the beatings he takes as a boxer on the way up are gruesome. Personally, I hate boxing. Willy Vlautin writes in a spare, stripped-down style. I never did figure out how he made me feel so much emotion about every single character. I totally loved Horace and Mr and Mrs Reese. I think I love the book because of its perfect balance of love and sorrow. Why should anyone read this super sad story? Well, anyone who does not like such stories should NOT read Don't Skip Out On Me. Anyone else will be amazed by how much it gets to you. "Sometimes reading about loneliness can make you feel less lonely. And perhaps you could try to be good like Horace and learn to do the right thing. I take inspiration from him and his patience. Maybe after you read the book, you'll feel a little bit less alone." This sounds to be such an interesting story. I had not heard of this author, but I'm eager to learn more about him. I think you would like him. All of his books are in my library. 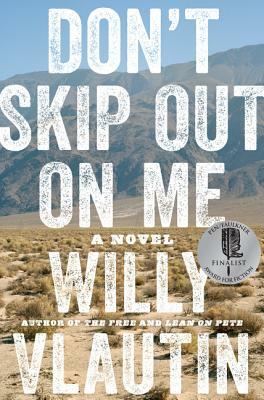 Sometimes sad stories are too much to take, but they do make the best reads if done right and 'Don't Skip Out On Me' seems like such a read. You are right. He does it right! This doesn't sound like the sort of book I would usually read, but I do remember enjoying one of Willy Vlautin's other books - Lean on Pete - so I will think about trying this one. Leon on Pete has been made into a movie, I learned yesterday. I hope you like this one if you try it. It sounds really sad but I wouldn't mind reading it. It seems that Horace found what he was looking for in the end, am I wrong? Wow excellent review. I'm a sucker for sad novels & movies. Give me a real tear-jerker any day. Willy sounds like a great guy too. And I like the name of the Nervous Breakdown book club. ha! You know, it was all good!